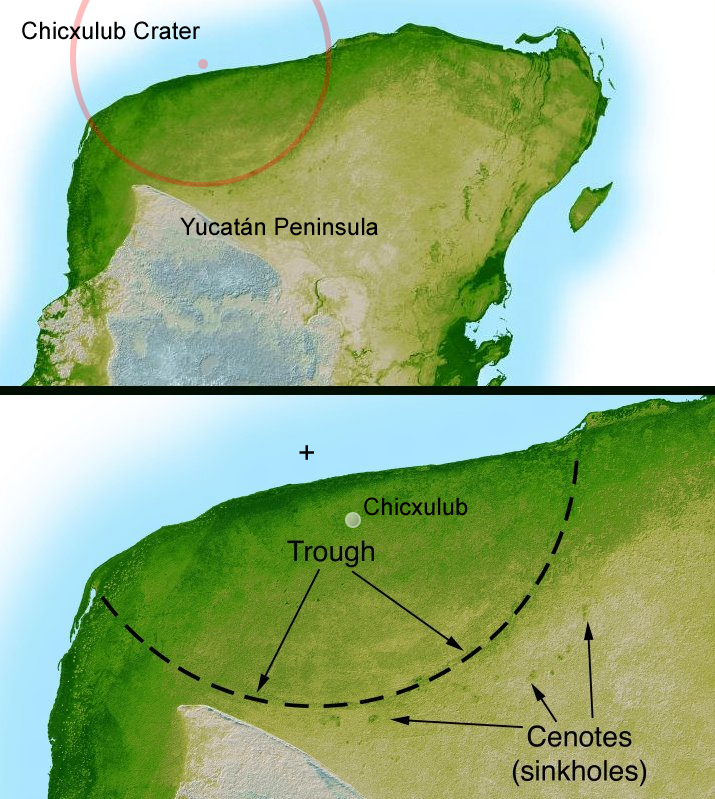 Sixty-six million years ago, an asteroid struck Earth in what is now the Yucatan Peninsula in southern Mexico. This event, known as the Chicxulub asteroid impact, measured 9 km in diameter and caused extreme global cooling and drought. This led to a mass extinction, which not only claimed the lives of the dinosaurs, but also wiped out about 75% of all land and sea animals on Earth. However, had this asteroid impacted somewhere else on the planet, things could have turned out very differently. According to a new study produced by a team of Japanese researchers, the destruction caused by this asteroid was due in large part to where it impacted. Had the Chicxulub asteroid landed somewhere else on the planet, they argue, the fallout would not have been nearly as severe. The study, which recently appeared in the journal Scientific Reports, is titled “Site of asteroid impact changed the history of life on Earth: the low probability of mass extinction“, and was conducted by Kunio Kaiho and Naga Oshima of Tohoku University and the Meteorological Research Institute, respectively. For the sake of their study, the pair considered how geological conditions in the Yucatan region were intrinsic to mass extinction that happened 66 million years ago. Another issue they considered was the source of the soot aerosols, which previous research has indicated were quite prevalent in the stratosphere during the Cretaceous/Paleogene (K–Pg) boundary (ca. 65 million years ago). This soot is believed to coincide with the asteroid impact since microfossil and fossil pollen studies of this period also indicate the presence of iridium, which has been traced to the Chicxulub asteroid. Previously, this soot was believed to be the result of wildfires that raged in the Yucatan as a result of the asteroid impact. However, Kaiho and Oshima determined that these fires could not have resulted in stratospheric soot; instead positing that they could only be produced by the burning and ejecting of hyrdocarbon material from rocks in the impact target area. The presence of these hydrocarbons in the rocks indicate the presence of both oil and coal, but also plenty of carbonate minerals. Here too, the geology of the Yucatan was key, since the larger geological formation known as the Yucatan Platform is known to be composed of carbonate and soluble rocks – particularly limestone, dolomite and evaporites. To test just how important the local geology was to the mass extinction that followed, Kaiho and Oshima conducted a computer simulation that took into account where the asteroid struck and how much aerosols and soot would be produced by an impact. Ultimately, they found that the resulting ejecta would have been sufficient to trigger global cooling and drought; and hence, an Extinction Level Event (ELE). Basically, Kaiho and Oshima determined that 87% of Earth would not have been able to produce enough sulfate aerosols and soot to trigger a mass extinction. So if the Chicxulub asteroid struck just about anywhere else on the planet, the dinosaurs and most of the world’s animals would have likely survived, and the resulting macroevolution of mammals probably would not have taken place. In short, modern hominids may very well owe their existence to the fact that the Chicxulub asteroid landed where it did. Granted, the majority of life in the Cretaceous/Paleogene (K–Pg) was wiped out as a result, but ancient mammals and their progeny appear to have lucked out. The study is therefore immensely significant in terms of our understanding of how asteroid impacts affect climatological and biological evolution. It is also significant when it comes to anticipating future impacts and how they might affect our planet. Whereas a large impact in a sulfur and carbon-rich geological region could lead to another mass extinction, an impact anywhere else could very well be containable. Still, this should not prevent us from developing appropriate countermeasures to ensure that large impacts don’t happen at all! What suddenly made the dinosaurs disappear 65 million or 66 million years ago? Whatever it was, all indications show that it was a massive extinction event. The fossil record not only shows dinosaurs disappearing, but also numerous other species of the era. Whatever it was, there was a sudden change in the environment that changed evolution forever. The leading theory for this change is a small body (likely an asteroid or a comet) that slammed into Mexico’s Yucatan Peninsula. The impact’s force generated enough debris to block the Sun worldwide, killing any survivors of starvation. There have been numerous theories proposed for the dinosaurs’ death, but in 1980 more evidence arose for a huge impact on the Earth. This happened when a father-son University of California, Berkeley research team — Luis Alvarez and Walter Alvarez — discovered a link with a 110-mile (177-kilometer) wide impact crater near the Yucatan coast of Mexico. It’s now known as Chicxulub. The data came from a Mexican company that was seeking oil in the region. The geologists saw the structure and guessed, from its circular shape, that it was an impact crater. Further observations were done using magnetic and gravity data, NASA said, as well as space observations (including at least one shuttle mission). The asteroid’s impact on Earth was quite catastrophic. Estimated at six miles (9.7 kilometers) wide, it carved out a substantial amount of debris that spread quickly around the Earth, aided by winds in the atmosphere. Was it simply ‘the last straw’? While an asteroid (or comet) striking the Earth could certainly cause all the catastrophic events listed above, some scientists believe the dinosaurs were already on their last legs (so to speak) before the impact took place. Berkeley points to “dramatic climate variation” in the million years preceding the event, such as very cold periods in the tropical environment that the dinosaurs were used to. What might have caused this were several volcanic eruptions in India around the same time. Some scientists believe it was the volcanic eruptions themselves that caused the extinction and that the impact was not principally to blame, since the eruptions could also have produced the iridium layer. But Berkeley’s Paul Renne said the eruptions were more a catalyst for weakening the dinosaurs. Here on Universe Today there are several articles on the asteroids and the Chicxulub Crater. Astronomy Cast has an episode on asteroids as bad neighbors.